First, thank you @Norbo for creating the most powerful open source physics engine. I found there has a gap between two convex colliders when they contact each other. Mobile mesh collider also has this problem, too. Did I miss something in doc? This is (probably) the collision margin. 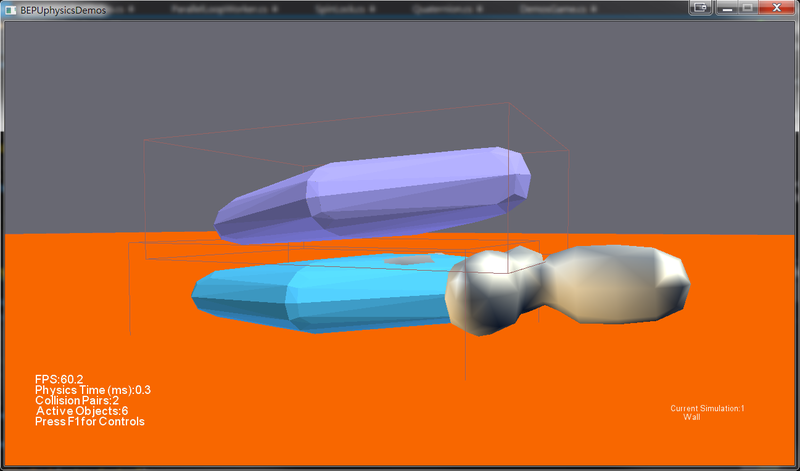 v1 uses an algorithm called GJK for shallow collision detection between many shape types including convex hull pairs. Standard GJK only works with separated objects, so the collision margin is used to keep the shapes apart. You can think of it as adding a little bit of rounded 'padding'. You can change the collision margin by setting the shape's CollisionMargin property. If not directly set, it uses CollisionDetectionSettings.DefaultMargin, which defaults to 0.04. For smaller objects or simulations, that can produce excessively large gaps. You can reduce the collision margin to 0, but performance and quality may suffer a little bit. Collision detection would be forced to fall back to a different algorithm. I feel so embarrassing that I didn't see this setting in code.